It’s been a year since I’ve started making GDEMUs so I dub these 3 units Anniversary Edition ones. They will now undergo extended testing and should ship early next week. And before you ask – I’m not planning on making any more green/gold units for now, but might try again sometime in future. The good: SD card sockets arrived and I’ve restarted my assembly line. The bad: All preorders are now closed, lists are full for weeks in advance. I keep getting tons of emails asking for another GDEMU production run – yes, there will be one, but I don’t yet know when exactly. My best guess is “in few weeks”, with a very broad definition of “few”. Pestering me about it is not going to speed up things. I HAVE NOT, AND WILL NOT START ANOTHER WAITING LIST UNTIL THE DATE OF NEXT PRODUCTION RUN IS KNOWN. NO, I WILL NOT MAIL YOU, OR THE FEW DOZENS OF OTHER INTERESTED PEOPLE, PERSONALLY WHEN I DO OPEN THE PREORDERS. WATCH THIS BLOG, IT’S HERE FOR A REASON. That should hopefully make things clear. 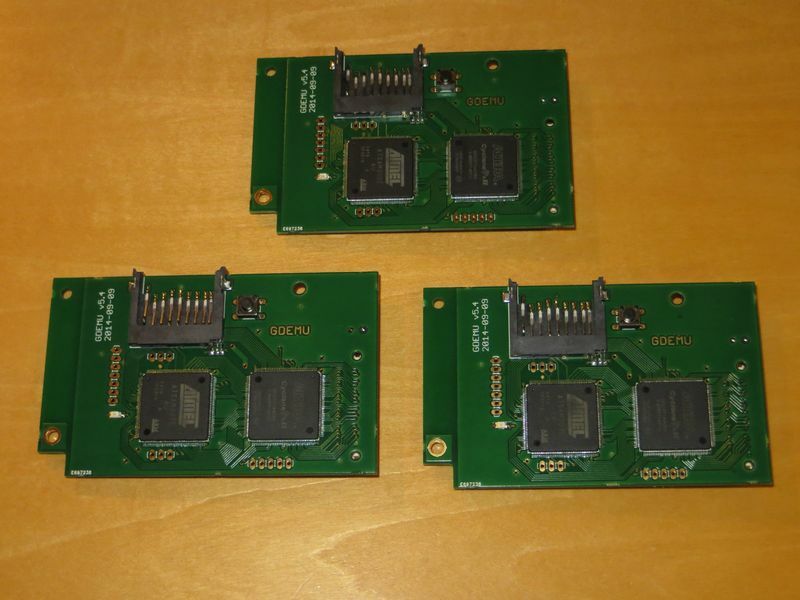 3x GDEMU PCBs that are green with gold finish. These are the latest v5.4 models that I ordered as a test for the gold plating plus possibly to replace my own v4 testing unit. The color combination is unique and if someone wants them I could sell 2 out of 3 for the usual price. 1x silver/black GDEMU that had to be reworked. Works perfectly now but suffered a bit in the process, so again it’s a cosmetic defect and shouldn’t actually be noticable once inside console. 1x v3 Rhea, that is the one that needs power wires soldered. There was a last minute cancel so it stayed with me and then I forgot all about it. This is the last of its kind. I might just be persuaded to lower the price on the blemished units ever so slightly. The other good thing is I will sell those out turn, on first come first served basis. Do note I still need to actually finish assembling the green ones though, but that shouldn’t take more than a week. In other news, I feel it’s unfair that I only get paid once and you keep playing with the ODE forever. So starting with next FW I will introduce Pay-to-Play system which will limit the active time of the devices to a certain number of hours. Once the time runs out the device will stop working until new FW is flashed. The unlocking FW will be available for a small charge, I’m targeting 1 USD for 25 hours but it’s not set in stone yet. I’m also thinking of making some of the features like the ability to have more than 20 images on the card an extra, paid for separately. Features will not time out except maybe after a year or so. Lastly there will also be a weekly lottery, anyone who writes a positive review or makes a flattering YT movie will be able to participate in it. Winners will get a free unlock for 100 hours of play. Possibly more if you can score more than one win in a row.